Every kid will no doubt want this bed design! Even though kids are small people, they have their own needs too. Like us, they also want to get things that they could call their own. Would you be happy if all you did was share or borrow with someone else all the time? Nope. It is in the norms of a human being to grasp on something that they can label “mine.” And kids are the same. Aside from buying your kids their own clothes, books, toys and other things they need, you can actually build them their own home. Yes, that’s right, their own house. But they don’t need to go far. By building them a house within your house through a structure or a space where they can play, rest, read, study and do many things at the same time. Isn’t it fulfilling to have a place like that? Didn’t you want to get your own space when you were younger? Of course, you did! 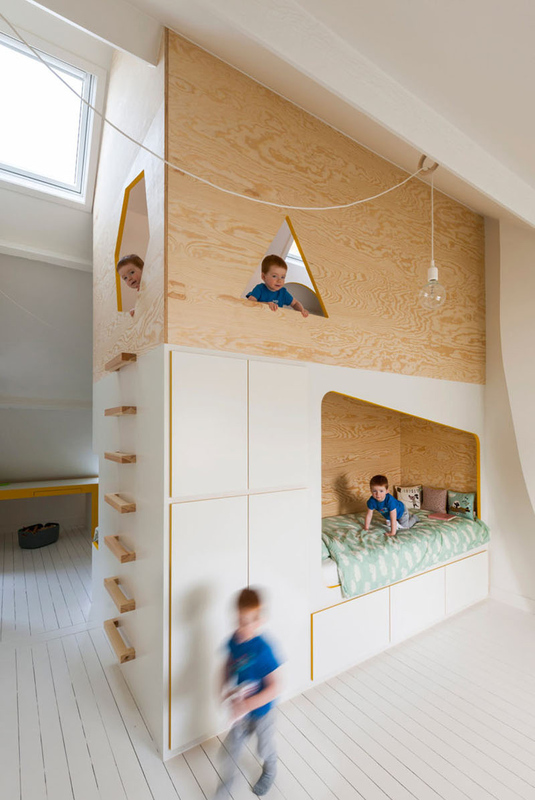 Give your kids a double-decker lofted bed like the one that Van Staeyen Interior Architects designed. This is what we are going to feature today. The kid’s bedroom is located in an old mansion dating from the beginning of the 20th century. The interior is very spacious with high ceilings which made it possible to build the structure. With that, the designers managed to prove a unique design to house two beds and a play space. Does that sound interesting to you? Then why not scroll down to see the images of this distinct modern minimalist bed design for kids. Unique feature: A kids bedroom is given a unique touch by adding a double-decker lofted bed that allows the kids to play, study and rest. Just by looking at this lofted bed, you already know how much fun the kids are getting while they play. Although there are many fancy lofted bed designs, this one has a minimalist approach and merely used wood and white colors in it. But despite being simple, it does not take away all the fun! The beds for each child are built-in on either side of the structure. With that, each child is given their own space. Aside from their own beds to sleep, they also have their own desks and windows! It would definitely be fun to have a space you can call your own. Every bed space has a small multi-level shelf that has been built into the structure. 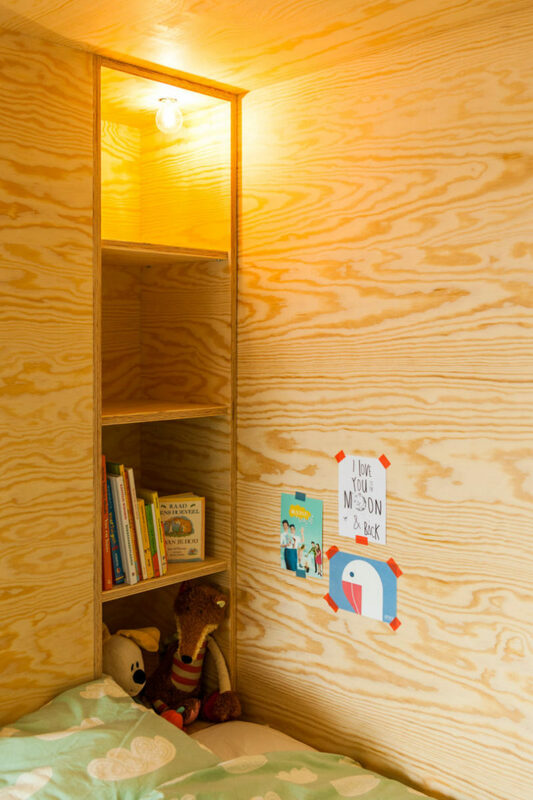 It provides a space for storing their favorite toys and books. Aside from that, it is also a place for a night light. But do you know what else is cute here? Well, if you set aside the cute cloud printed beddings, you will surely notice the creative wall decors that are taped inside the structure. Across the bed is a long table that faces a window on the vaulted ceiling. You can notice that aside from the white colors, there are also yellow accents in the space that brings a brighter and livelier feel in it. Who says yellow is merely for girls? What I find interesting here is the curved column. Apparently, the designers were able to put a twist even to the architecture of the home to make the interior look more eye-catching. This bedroom really played well with shapes! Between the two sides of the structure is a ladder that leads up to a lofted play space. The ladder is built-in the bed which is also made from wood. 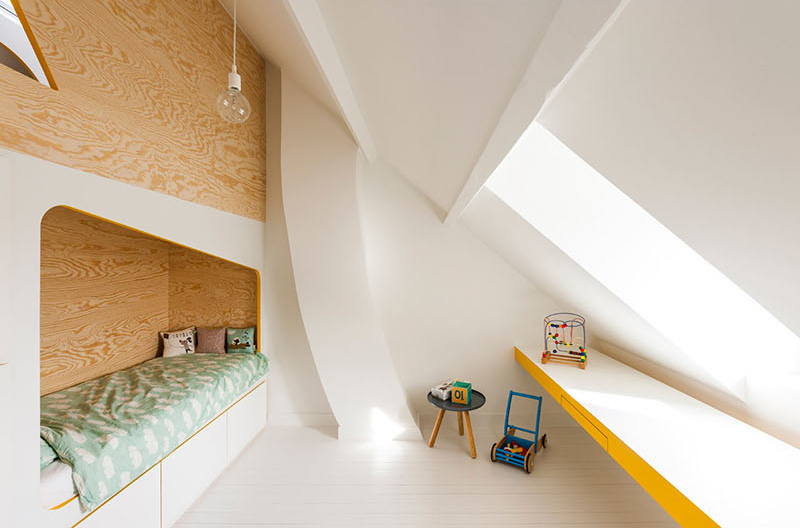 Its simple minimalist design looks very neat and makes it easy for the kids to navigate the lofted bed. 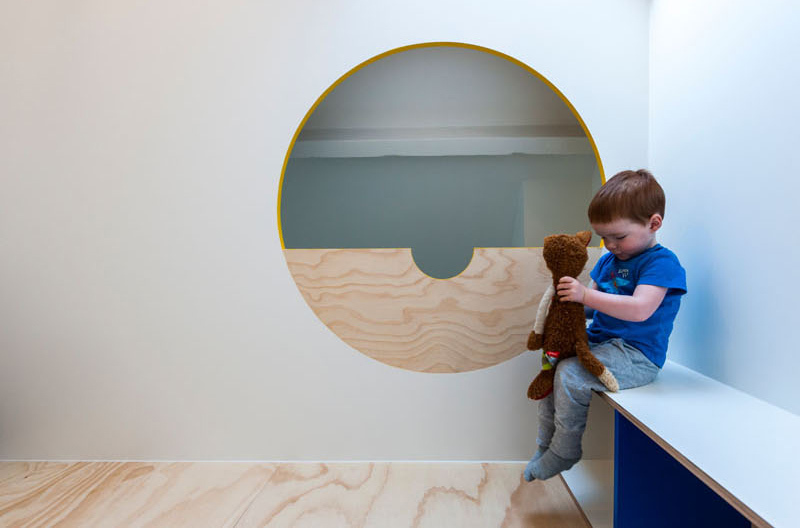 Want to see more modern kid’s spaces? 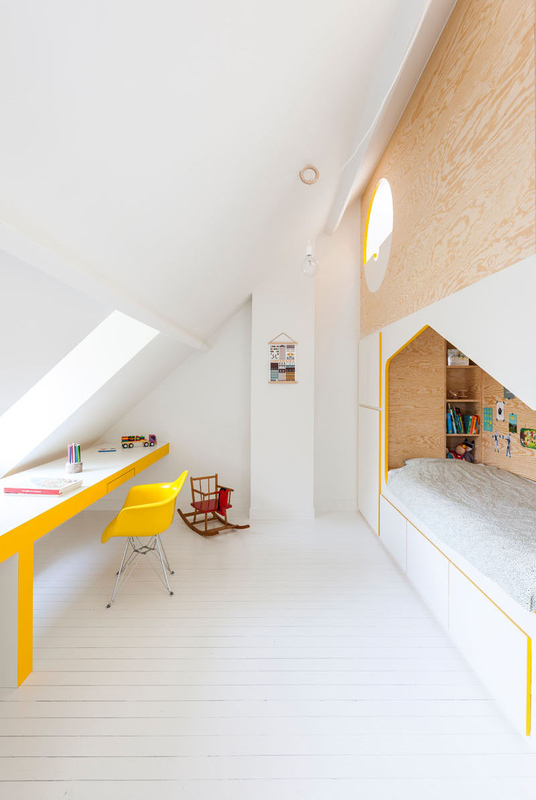 Check out this list of modern kid’s bedroom for girls and boys. 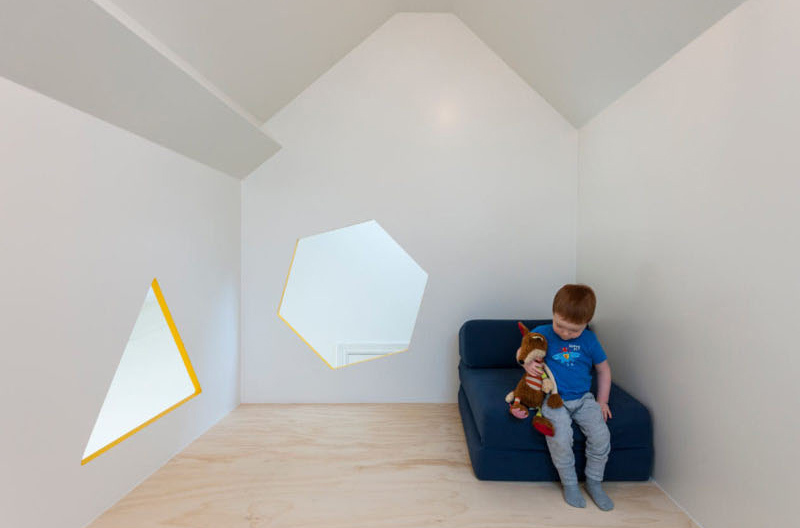 Cut-out shapes act as windows wherein the kids can look out to the rest of the bedroom. What you can see here is the lofted area where kids can play safely. It also utilized the combination of wood and white. Don’t you think this is an amazing space for the children? It provides them a place to rest, study and even play! It’s like there is nothing else that they could ask for! Nothing really beats a space with a play area like a summer house in Russia. 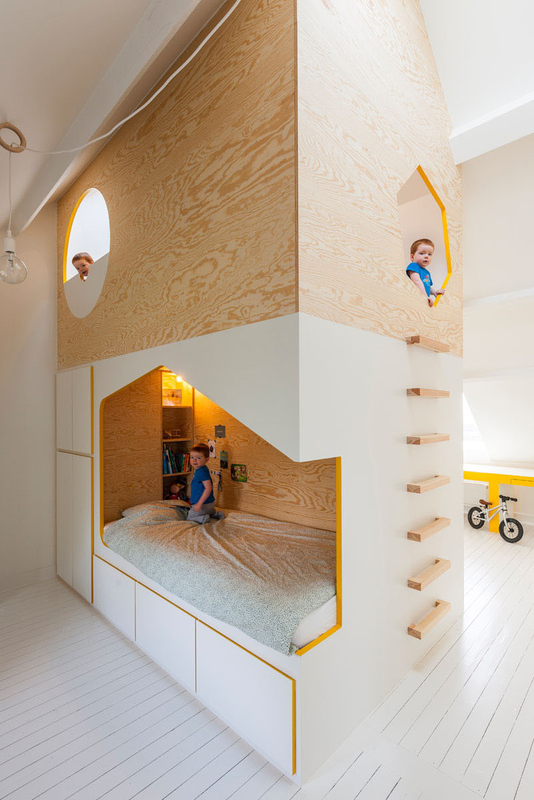 This lofted bed is indeed an answer to the children’s need to have their own space. Having a bed like this is like going beyond the limits of a normal bed which most parents would provide for their kids. Another good thing about this bed is that they can use this even when they are already teenagers. The lofted playing room can turn into a multimedia place once they grow up. This structure is designed by Van Staeyen Interior Architects who really made the kids happy with their innovative bed design. Would you get your kids a bed like this? Well, why not, right? We would definitely give our kids anything they want as long as we have the budget. What a fun bed! I live in a vintage home and space is at a premium. This looks perfect as it saves on space for two beds and play space. I really love that bed.